The building was designed in the late 1970s, constructed in the early 1980s, and completed and opened in 1983. Architect: Department of Public Works, NSW. The Bidura Children’s Court is a multi-storey, white off-form concrete building in the late 20th-century Brutalist style. The building sits on a podium with two levels set below the ground. The upper levels step back from three of the site’s boundaries, further reducing the building’s mass and scale. Expressing each level are wide, cantilevered terraces edged with reinforced concrete balustrades and tubular railings. Juxtaposed against the floating horizontal terraces are several semi-cylindrical vertical elements that express stairwells. The original scheme included landscaping in planter boxes around the edges of each terrace to further soften the building. From a distance, it would have been substantially clad in green, with an almost ‘Babylonic’ appearance. 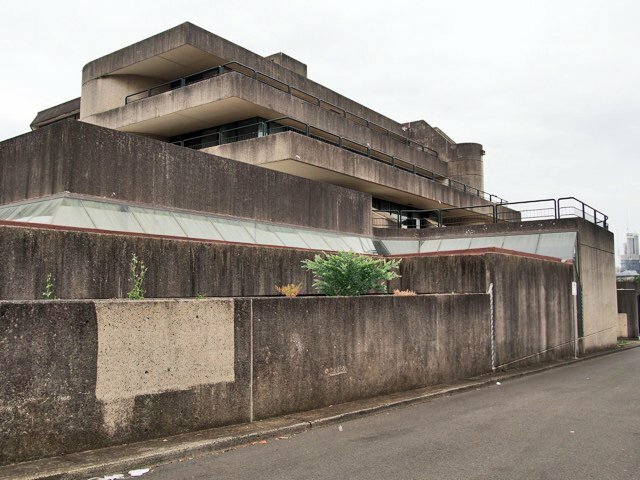 The existing building is a substantially intact example of a Brutalist building that has undergone only minor alterations over the three decades since it was built. It has suffered from a lack of maintenance and neglect over the years. The following images, showing the building as it is today (totally neglected), were taken in December 2015 by Jenna Reed Burns. Some of the images show recent cleaned test patches on the exterior wall, which reveal the original white off-form concrete with exposed blue metal and brown river stones and a bush-hammered finish. Additional images of the building taken soon after its completion in 1983 by architect Andrew Milcz.